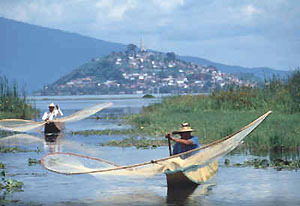 Michoacan, which is an Aztec word meaning 'Place of the Masters of Fish' lies on the west coast of Mexico. Its capital, Morelia, is 195 miles due west of Mexico City. Not an obvious tourist area, it is a state of quiet beauty, and has a great variety of attractions. In the east of the state lies the Sanctuario Mariposa Monarca - the Monarch Butterfly Reserve. The reserve may be visited between November, when the butterflies start arriving from the USA, and March. In any given year there may be between 200 and 500 million butterflies spending the winter months here. The capital, Morelia, has the cultural attractions expected. Several museums, including the Michoacan State Museum. Jose Maria Morelos y Pavon, who was an important figure in the struggle for Mexico's independence, was born in the city (and it is in fact named after him) and there are several museums dedicated to him, including his birthplace and his own home. Another must see while in Morelia is the cathedral, which took over one hundred years to build, being finished in 1744. it dominates the Plaza de Armas. South of Uruapan is the Cascada de Tzararacua, a 30 metre waterfall. There are 557 steps down to get close to it, although a horse can be hired to take you down, and back up again! Also not far from Uruapan is Tingambato, the ruins of a ceremonial site dating from AD 450. There is a ball court, a pyramid and a tomb. A museum at the site has photos and small discoveries. One of the most famous sights in Michoacan is Volcan Paricutin, a volcano that literally came out of nowhere. It first started to appear in 1943 and rose 410m in one year. It grew for approximately nine years but has been dormant since 1952. It covered two villages with lava, although there were no casualties, as the lava was very slow moving, and the top of the church of one of those villages can be seen peeking out of the solidified lava. The volcano can be climbed, it stands at 2800 meters. Balneario Erendira, hot springs resort & cabins, Los Azufres, Michoacan. Centro Vacacional Tocumbo, hotel & aquatic park, Tocumbo. Delfin Playa Azul Hotel, on the beautiful pacific coast beaches of Playa Azul. Esmeralda Inn, a hotel in Maravatio, Michoacan. Hacienda Cantalagua Hotel & Country Club, is located in Contepec, Michoacan. Hernandez, a hotel in Maravatio, Michoacan. Hotel Tarasco Quiroga, a charming small hotel located in Downtown Quiroga. Las Palmas, a hotel in Huetamo. Los Arcos, a hotel in Tlalpujahua, Michoacan. Morenita, a hotel in Ciudad Hidalgo. Ocampo, a hotel located in Maravatio. Ojo de Agua, located in Ciudad Hidalgo. Plaza de Sahuayo, a hotel in Sahuayo. Posada del Carmen, a hotel in Tlalpujahua. Real San Pedro, a hotel in San Pedro Jacuaro. Yuritzi Hotel, located in Caleta de Campo on the Michoacan Pacific coast. Bungalows de la Curva, rentals in Playa Azul, Michoacan. Parador Turistico Caleta de Campos, on Michoacan's beautiful pacific coast. Cabañas Rincon de San Miguel, rustic style cabins on Lake Zirahuen. Chalet Cerrito Colorado, rental on Lake Zirahuen. Impulsora de Zirahuen, cabin rentals in Zirahuen. Meson Maracuya, rustic cabins with spectacular view of Lake Zirahuen .